Lovable Labels is a Canadian company that specializes in permanent labels. Their labels are UV resistant, microwave and dishwasher safe and are made to withstand children’s environment. They feature a “perma-grip” backing that will stick to almost any surface. Lovable Labels are bright and very easy to spot, which makes it easier for kids to find their belongings such as lunch boxes and shoes. Some of their products include multi-purpose labels, clothing labels, bag tags, household labels, safety products and stationery. The Lovable Labels has a brand new product called the “Wire Tags” and I got a chance to review this product. For my experience I am officially in love with “Wire Tags” from Lovable Labels... it’s extremely handy and very useful for everyday life. Plus my dad actually took some wire tags for me to use for some of his wiring equipments and he also love it. I have been using these tags since May 10th and it amazing. These tags are extremely helpful; it literally helps me to exactly what wire is what. Plus, it made my messy computer table fill with wire into a better, cleaner and organized place. My dad also, found this extremely helpful with his electronic systems, he actually asked me to buy him a set of wire tags as his father’s day gift and some of my friends for my campus also compliments and questions about where to gets a set of the wire tags (cause I had it on my laptop wire). Also, the tags are actually very sticky – which it a good thing – most of the stickers try labels I buy don’t really last long, these tags are still good as new. Also, they are really bendable, but it’s doesn’t rip (it still haven’t ripped yet). Also, when I received the package, it was packed in a white envelope with cute adorable cartoons (which I adore). You can purchase the Lovable Labels Wire Tags from their website directly. Do check out their website as they have lots of other products available! 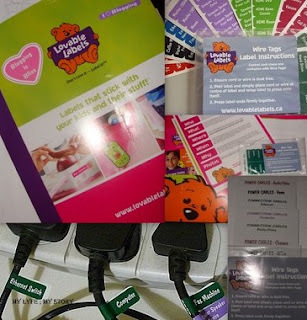 However, Lovable Labels has generously supplied me with a "Wire Tag Label Pack" for one lucky winner! Thanks, Lovable Labels! The Lovable Labels has graciously offered to giveaway a set of “Wire Tags” to one lucky reader of My Lyfe ; My Story. All entries must be received by 11:59:59 pm (GMT) Eastern Time (US & Canada) on June 3st, 2011. A winner will be chosen via random.org. The winner will be notified via email and have 48 hrs to respond. If no response with 48 hrs a new winner will be chosen. Open ONLY to US & Canadian residents. Disclaimer: I received a set of Wire Tags labels free of charge for review purposes. The opinions expressed in my review are honest and my own, based on my personal experiences with the product and not influenced by monetary compensation. Wow it's so amazing that your in your 20s and adttenting University! That's so great! Thanks so much for posting your review on our new Wire Tags. They really help get messy wires organized. Thanks again and can't wait to find out who wins. Good luck in Uni! lovely giveaway! good luck to everyone! if you want do the same! I have not known. I will look for them at SONY PLAZA is shops in Tokyo. oh my! i need those tags and labels to get organized..this is a great post! anyway, i love your blog! browsed through your pages and I really enjoyed reading..effortlessly chic! i'm your new follower. hope you follow back! lol..kisses! What a great idea! I need one of those. Fab giveaway and thank you honey! Woohoo, a giveaway! I also want to do a giveaway sometime but I'm know sure when and what to give away.. If you have some tips, please let me know! If you are somewhat interested in getting featured on my blog I'd love to hear that from you! Please, let me know! I'd love to hear from you again in the near future! i'm following you now, hope to see you following back soon. oh my.. the labels are incredibly useful! goodluck on your giveaway, and sure we could follow each other just lemme know dear! This giveaway looks amazing. the wire tags are just brilliant. i would join the contest but i'm not US or Canada resident, so yea. :) I followed your twitter (and blog) anyway. hope you dont mind. Great giveaway!Good luck to everyone! Hi,I am following you as well! I've sent you an email about getting featured on my blog, email me back when you can..
i absoluetly love your blog! now i'm starting with a new blog, turning a new page in my life..
Oh my gosh, I love your blog! It's so charming! I was hoping we could follow and friend each other! Thanks! Thanks for your comment. I do not see you in my google friend connect list following my blog. Nun scheint es, dass er einen anderen Weg gefunden hat, um Menschen ihre Medizin zu geben. It's awesome to pay a quick visit this site and reading the views of all colleagues regarding this paragraph, while I am also eager of getting knowledge.